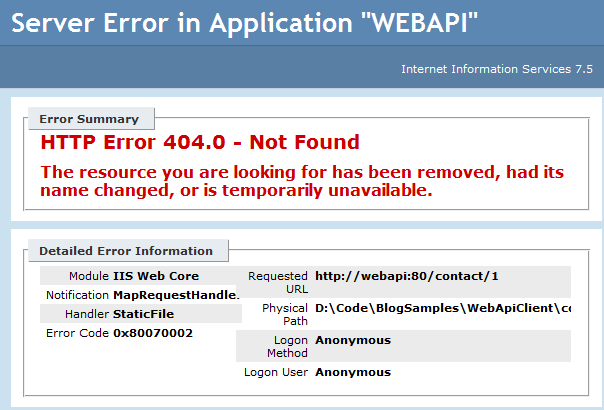 As you know, WCF Web API relies on .NET Framework 4.0. 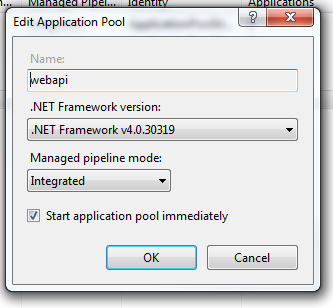 (If it’s not working after installing ASP.NET 4.0.x please review the version in your application pools settings again and fix it if necessary). 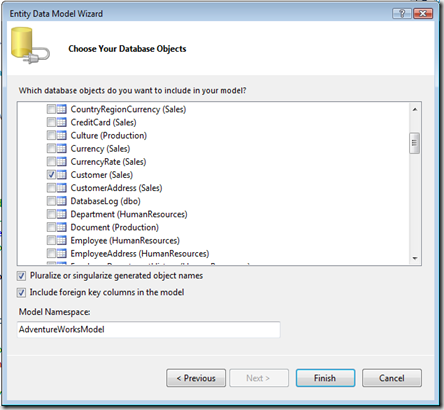 This post discusses how to displays data from the AdventureWorks Database on to Silverlight pages. 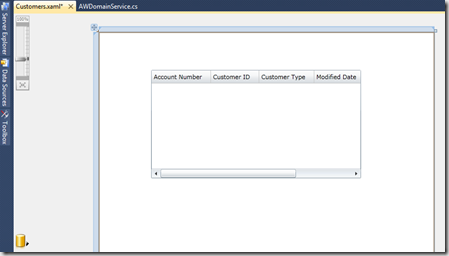 In this walkthrough you will find the page that displays the data from customer table in adventure database and allows the user to traverse the records. 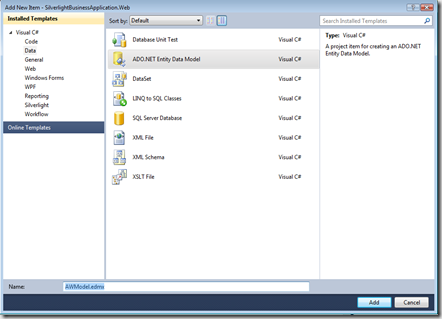 You need to have Visual Studio 2010 SP1 installed on your machine. 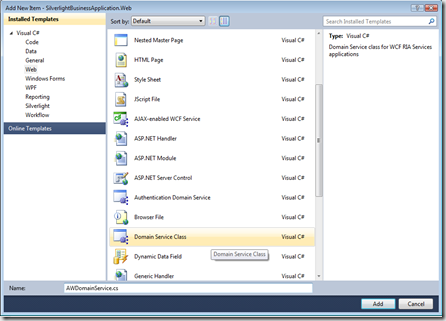 Silverlight business application contains two projects a Silverlight application and an ASP.NET Web application which hosts the Silverlight application. 1. 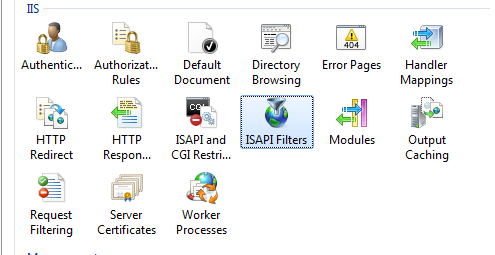 In solution explorer right click the Views folder Silverlight client application, Add New Item dialogue box , select the Silverlight Category and then click the Silverlight Page template. 2: <HyperlinkButton x:Name="Link3" Content="Customer List"
Microsoft's official website for Silverlight states: "Silverlight is a powerful development tool for creating engaging, interactive user experiences for Web and mobile applications. Silverlight is a free plug-in, powered by the .NET framework and compatible with multiple browsers, devices and operating systems, bringing a new level of interactivity wherever the Web works." Silverlight has become the platform of choice for building next generation of cross-browser, cross-platform Rich Internet Applications (RIAs). The latest version – Silverlight 5 - introduces many new features that cater to business application development and media experiences. Silverlight 5 introduces 64-bit browser support, so, you will notice faster start up times and hardware acceleration. Support for RIA Services in Silverlight is even better, with enhanced MVVM support and improved support for customization of generated code. WCF is the platform of choice for building services that can be consumed in any platform. The MSDN states, "Windows Communication Foundation (WCF) is Microsoft's unified programming model for building service-oriented applications. It enables developers to build secure, reliable, transacted solutions that integrate across platforms and interoperate with existing investments." WCF RIA Services help you to get data from disparate sources without the need of service plumbing. The MSDN states: "WCF RIA Services simplifies the development of n-tier solutions for Rich Internet Applications (RIA), such as Silverlight applications. A common problem when developing an n-tier RIA solution is coordinating application logic between the middle tier and the presentation tier. To create the best user experience, you want your RIA Services client to be aware of the application logic that resides on the server, but you do not want to develop and maintain the application logic on both the presentation tier and the middle tier. RIA Services solves this problem by providing framework components, tools, and services that make the application logic on the server available to the RIA Services client without requiring you to manually duplicate that programming logic." There have also been enhancements in text and printing support. Silverlight 5 introduces vector based printing. Text clarity in Silverlight 5 is much more improved, thanks to the Pixel Snapping feature. OpenType support in Silverlight 5 is also enhanced. Silverlight 5 enables you to control media playback with remote control devices. The Digital rights management feature enhancement in Silverlight 5 allows you switch between DRM and media sources seamlessly. 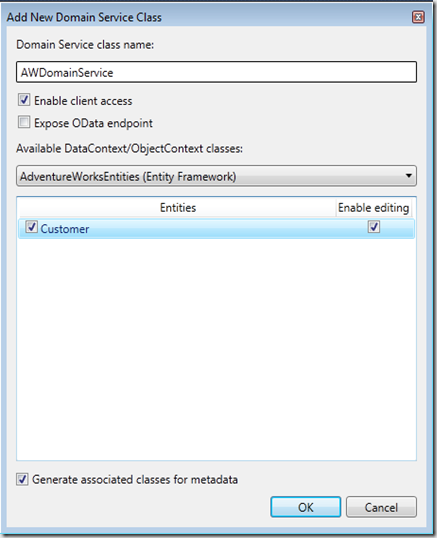 Silverlight 5 also comes with an improved power awareness feature. When viewing videos in Silverlight 5, you won't be distracted with screensavers. When the video is not being viewed, the screensaver will be back in action. Silverlight 5 provides support for reduced network latency using a background thread for networking support for improved performance. John Papa states: "Hardware Decode and presentation of H.264 improve performance for lower-power devices to render high-definition video using GPU support." 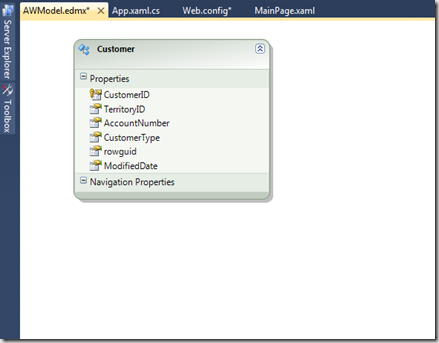 Silverlight 5 comes with improved data binding and debugging support. 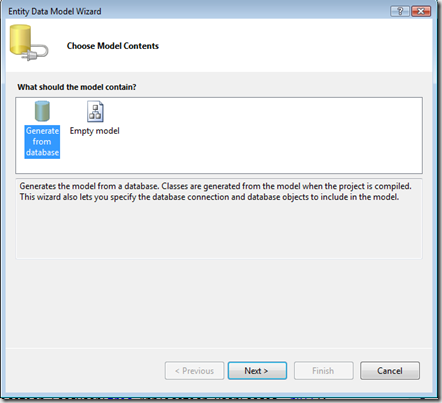 Data binding is the act of binding data to data controls. The latest version of Silverlight also provides rich 3-D support. Silverlight 5 introduces accelerated 3D graphics. The Graphics Processing Unit (GPU) has been enhanced in the 3-D application programming interface (API) in Silverlight 5. The GPU provides support for accelerated graphics. The MSDN states: "Silverlight 5 RC introduces the ability to use hardware accelerated 3D graphics in your Silverlight applications. This opens up a whole new set of scenarios that are possible in Silverlight, such as 3D drawn controls, data visualizers, 3D charts, scatter points, geographic overlays, and 3D games and simulations. This topic goes over using 3D graphics in Silverlight." 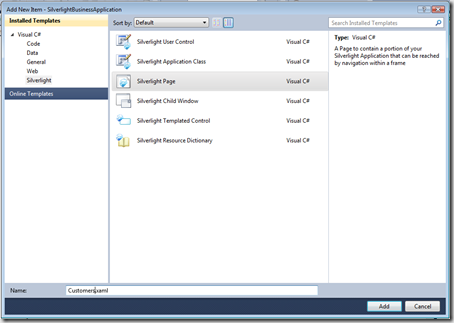 Silverlight 5 also brings Desktop capabilities to the browser for the first time. According to John Papa: "Silverlight offers a new class of trusted applications that brings desktop capabilities to the browser for the first time. 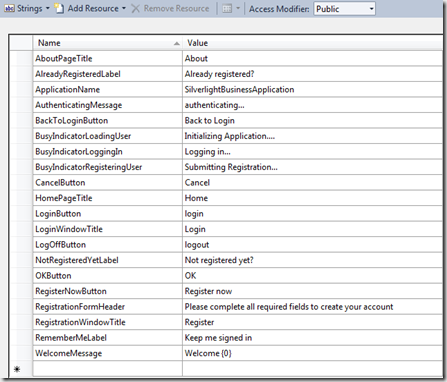 These features, when enabled via a group policy registry key and an application certificate, mean users won’t need to leave the browser to perform complex tasks." There are many great features in Silverlight 5 as have discussed above and if you are looking for Silverlight 5 hosting, you can host your Silverlight 5 site as low as €3.00/month with HostForLIFE.eu.